The leprechaun is the most famous fairy living in Ireland. Leprechauns started appearing in Irish legend in the medieval times. 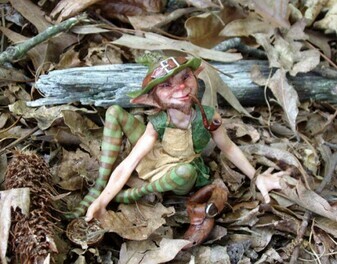 Traditionally, leprechauns are tall fairies and often appear to humans as an old man – much different from the modern view of a small, childlike fairy in a green suit. Leprechauns are different from traditionnal fairies because they have got jobs : the make shoes for Irish poor people. As legend holds, Leprechauns love to collect gold, which they store in a pot and hide at the end of a rainbow. If a human catches a leprechaun, the fairy must grant the human three-wishes before he can be released.